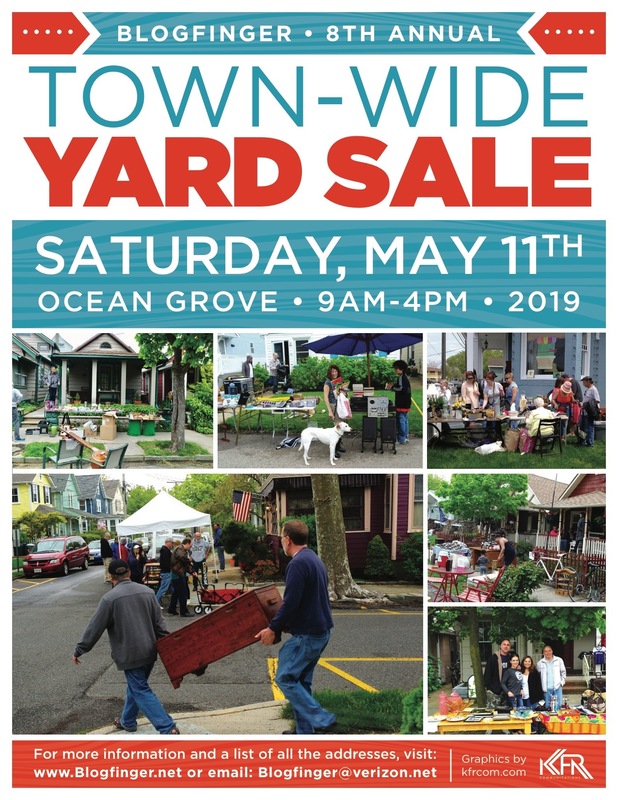 8th Annual Ocean Grove Town-Wide Yard Sale Scheduled for May 11, 2019. Mark your calendars. Click the flier to enlarge the photographs. Blogfinger.net photos. 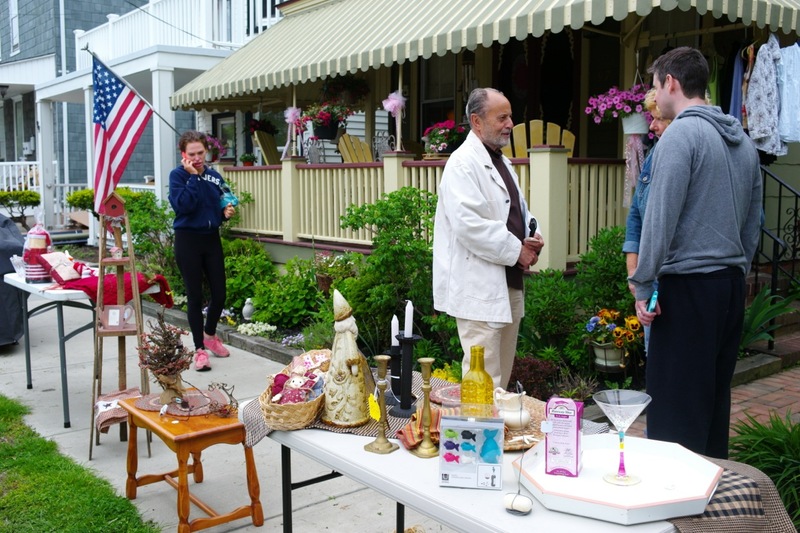 We recently took the pulse (opinion poll) of 89 Grovers to find out if they thought that the Town-Wide Yard Sale in Ocean Grove was a good idea. 80% said yes. So we will continue with the tradition.—this is the 8th Annual. Last year we had over 60 sellers, and we hope to do better in 2019, because the more sellers, the more buyers. But 60 is a very good number for a small town sale, and OG is a perfect sort of town to have this event. Andrew Gioulis of KFR Graphics updated our flier including 4 new photographs from prior years’ sales in the Grove. We will operate the sale the same way as the past, using Blogfinger to actively maintain an updated list of sellers and their merchandise, but that won’t happen until the spring. You will be able to join the list or add items right up to sale day. We will begin publicity in 2019, probably in April. JESSICA MOLASKEY from her album Pentimento. 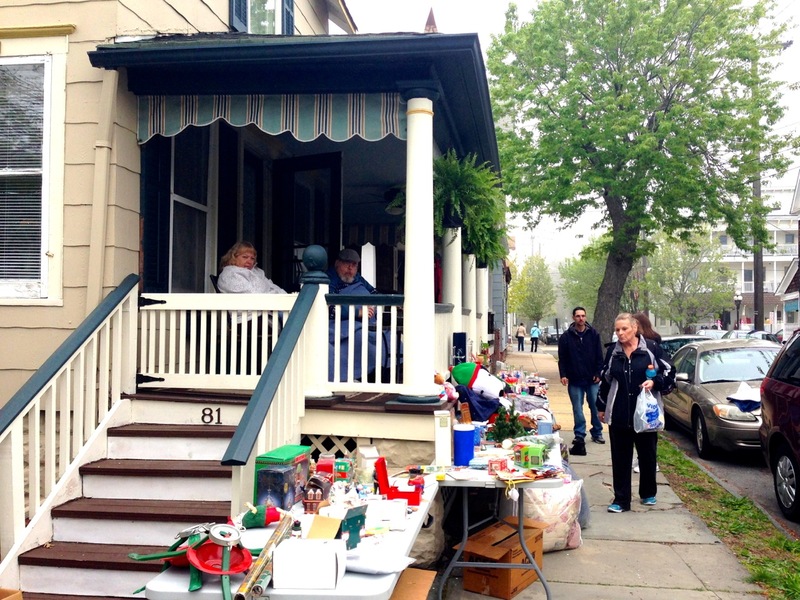 Town-Wide Yard Sale breaks record with 75 addresses. Sales are popular until rain hits, but the show must go on, and it does. The weather man let us down for the 4th Annual Blogfinger Town-wide Yard Sale. After reports of fine weather for Saturday, fog and chilly temperatures rolled in this morning. The sales all over town quickly burst into a hive of activity. Out-of-towners and Grovers used the Sale maps and address lists which we provided in addition to the Internet post and made the rounds rather quickly. A lot of goods were sold within the first couple of hours. As predicted, most of the sellers and buyers enjoyed the social interactions as they found all sorts of goodies to buy. We met a man who was buying gold and silver. He told us that he paid one Grover over $2,000.00 for jewelry. People drove, walked and biked to the sale locations. At around 10:30 am it began to rain. Although the rain didn’t last long, it did put a damper on the situation. Some sellers folded their tents, while others battened the hatches (thank goodness for porches) and then resumed the marketplace later. I rode around on my bike after the rain and found almost everyone I came in contact with to be happy and excited about the event. By 2:00 pm, it began to drizzle and fizzle. But, I have noticed that our yard sales tend to poop out by early to mid afternoon. We should consider making next year’s event for 8:00 am to 1:00 or 2:00 pm. Not enough room? No problem. Blogfinger photo. 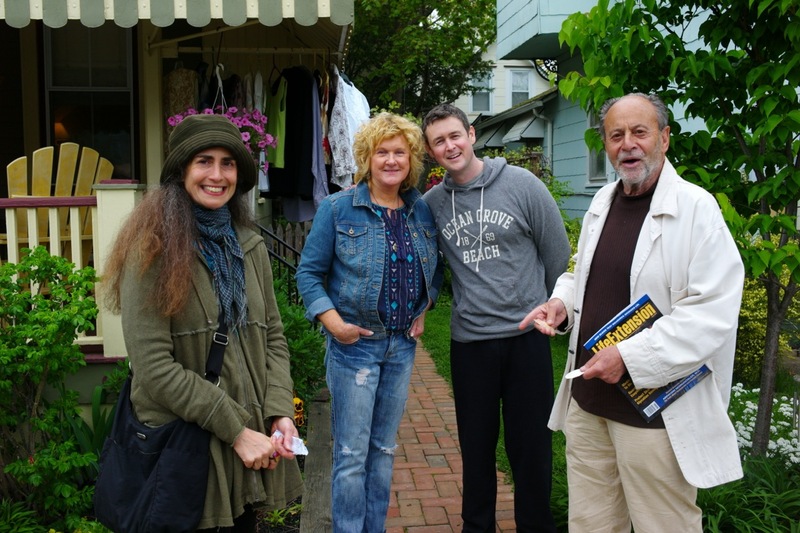 I met several sellers who live in Manhattan and Ocean Grove, and they love it in the Grove and they were getting a kick out of interacting with the folks. All said they wished they could spend more time here. Parking was no problem for this weekend, so many buyers drove around town, although I did meet some who walked everywhere, from neighborhood to neighborhood. Conversations. The heck with the sale—on Heck. At our sale, Eileen and I had all sorts of interesting conversations about our for sale items, but others had to do with seeing Grovers who had returned from their winters away as well as other topics such as the guy who recommended the new Asbury beer garden as a place to hear first rate live music. He said that he was just there to hear a Grammy nominee perform on guitar, doing jazz in the style of Django Reinhardt. A woman even had something to say about the music we were playing. She said that she was “acoustically sensitive.” She was liking Nora Jones—–someone worth being distracted by. We were selling some vinyl 33 1/3 records, mostly of Broadway shows. I visited a number of our sites. Someone sold a bicycle for $150.00. Another couple quickly sold a bedroom set. Several people approached me with a variety of “scoops” for Blogfinger—in the spirit of the citizen reporter. We received enough compliments and words of encouragement for BF to last quite a while. 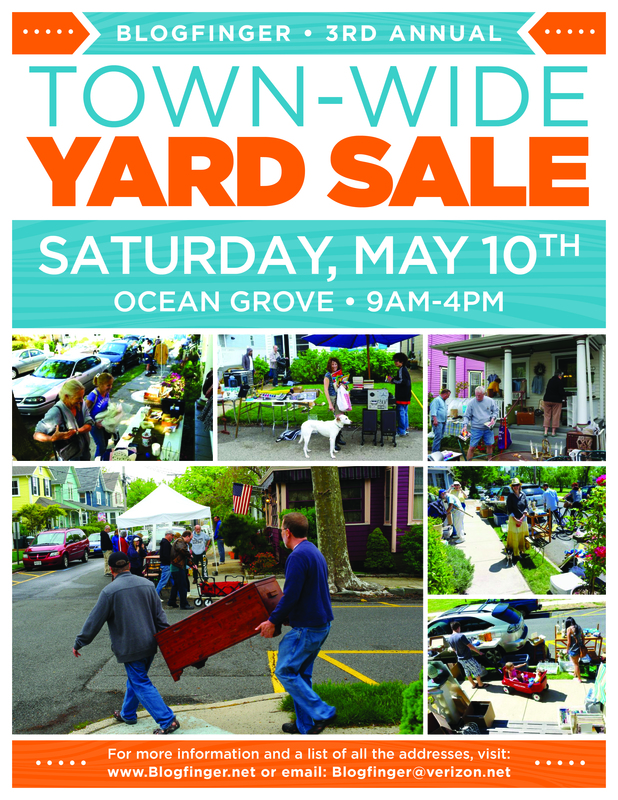 The Ocean Grove Town-Wide Yard Sale. Still plenty of time to sign up for May 9 in Ocean Grove. Since some of you probably haven’t peeked at the Town-Wide Yard Sale list, here is a reminder to look up and click on the Yard Sale tab which is posted up at the top this Blogfinger page (see tab: “Town-Wide Yard Sale”) We currently have 57 families, which is quite good, but we want more. Contact us at Blogfinger @verizon.net. You can put out a few things and then quit before the 4 pm closing time. I will make a note on your listing. Many will wait until later to give us all their sale items. A few days before the sale, we will move the entire list to the top of Blogfinger so that even a lost out-of-towner will find it. If you want to direct someone to the list , tell them to go to http://www.Bllogfinger.net and click on the tab on top or see the list immediately starting on Wednesday. YARD SALE MUSIC. If you are dreaming of selling out, you might have to settle for a consolation prize, but it will be fun trying. 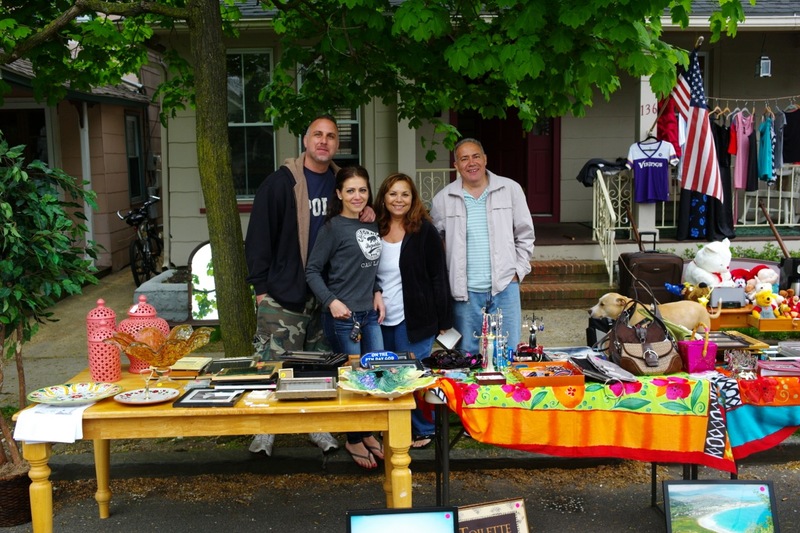 The Neptune Township Committee revised their ordinance regarding permits for yard sales on Monday April 28. Today we spoke to Mr.Vito Gadaleta, Township Business Manager, who assured us that the Construction Office will provide $5.00 permits for those involved in our town-wide sale as well as any subsequent group sales. Remember to tell them that you are with the band—er, you are with the group sale. We have already broken the record for number of families participating. Currently we have 51 families involved. This is better than some other towns that have been doing town-wide sales for years. You can sign up to be on our marketing list as late as Friday, May 9, until 9:00 p.m. If any of you want to pick up a list of addresses to copy and distribute to your customers, please stop by. This event is as much a social happening as a chance to get rid of stuff and make a few bucks. Contact us by email: Blogfinger@verizon.com. 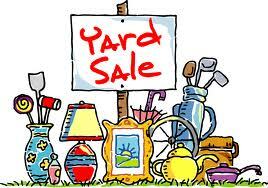 For the list of participants, click on the Yard Sale tab at the top of this page. Watch for our posting of the list on Wednesday. 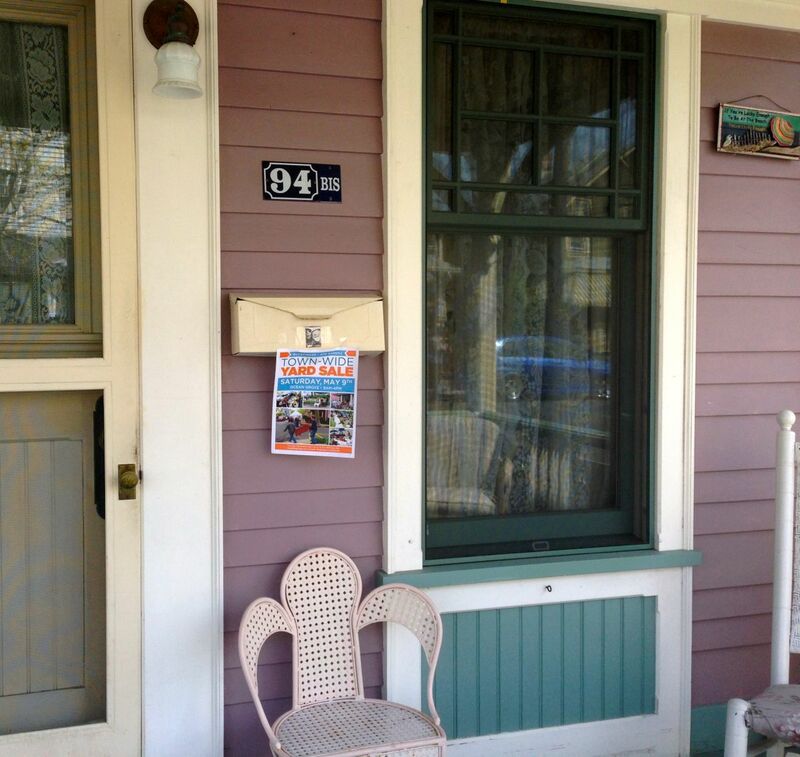 If any of you participants know of a place where you can place one or more of our fliers, please stop by 113 Mt. Hermon Way (corner Delaware) to pick some up. How about your church, your favorite shop including places you frequent in surrounding towns. We can use the help.